The idea of a pilotless aircraft, or drone, is not a new concept ~ in fact, it dates back to the mid-1800s, when Austrians sent off unmanned, bomb-filled balloons as a way to attack Venice. Today’s technologically innovative drones, or Unmanned Aerial Vehicles (UAV) can be controlled either autonomously by onboard computers capturing what the drone ‘sees’, or by remote control with a pilot on the ground or in another vehicle. While first used by the military, drones are now used in the private sector by police, firefighters, surveillance for sports and for movies. With the introduction of the Sony FCB-MA130 high definition camera, the world of the small camera has just gotten larger. With its 16x zoom, this all-in-one color camera is an impressive new addition to the popular FCB Block Camera Series. Thanks to Sony’s renowned high-quality 1/2.45-type Exmor™ CMOS sensor and Sony’s original image signal processor, the FCB-MA130 HD CMOS camera allows users to capture Full HD resolution (1080p/30) movies and 13-megapixel still images, while assuring superb picture quality in both. Multiple useful features are available thanks to Sony’s original image processor: Image Stabilizer, Face Detection, Wide Dynamic Range (ATR) and Noise Reduction (3DNR). Also available is a one-push auto focus (AF) function, optimized picture quality, backlight correction, E-flip and Mirror Image, and a shutter speed of 1/25 to 1/5,000 sec, 24 steps. 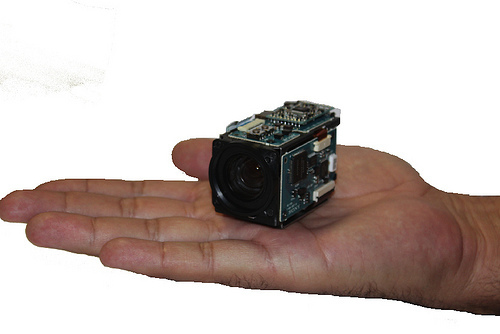 This amazingly minute camera measures a mere 21/32 x 13/32 x 23/32 inches (16.5 x 10.3 x 18.0 mm), and weighs 0.078 ounces (2.2g). With such a diminutive size, it can be effortlessly incorporated into space-restricted products. The drones of today require precisely such a camera. One Interface Kit for the Sony FCB-MA130 camera includes a USB 3 Interface Board, 47.6mm Ribbon Cable, 6 foot (2 Meter) USB 3.0 Cable, and is for desktop computers without an Embedded USB 3. With its fast and simple installation, this USB 3.0 PCI-E Express Card presents a straightforward answer for connecting a standard desktop PC to USB 3.0 devices (A Male to Micro B cable). Utilizing the latest generation of USB technology, this USB 3.0 card features increased transfer rates of up to 5 Gbps, giving you the availability of transferring videos, music, photos, and data files between USB devices and your computer at tremendously fast speeds. For those desktop computers with an Embedded USB3, the ideal Interface Kit includes a USB 3 Interface Board , 47.6mm Ribbon Cable, and 6 foot (2 Meter) USB 3.0 Cable (A male to Micro B Cable). This AVP-MA130-USB3E kit is a perfect video capture bundle solution for the minute Sony FCB-MA130 camera, and is small enough to fit into many applications while capturing high quality images and videos for easy streaming to a USB 3 host. With Output Video Resolutions of 1920×1080 (Full HD), 1600×1200 (UXGA), 1280×960 (SXGA), 1280×720 (HD), 1024×768 (XGA), 800×480 (WVGA), 640×480 (VGA), and Output Still Image Resolutions of 4192×3104, 4128×3096, 3264×2448, 2592×1944, 1920×1080, 1280×960, 1280×720, 640×480 you are sure to get the best still and moving pictures possible! Outstanding compactness, and the ability to capture Full High Definition (1080p/30) moving pictures coupled with high-quality still images – it is anticipated that this remarkable, tiny camera is set to open up brand new industrial applications. With its small size, excellent image quality, and reliability of the Sony name, the FCB-MA130 camera is going places … and many of them will be up in the air!